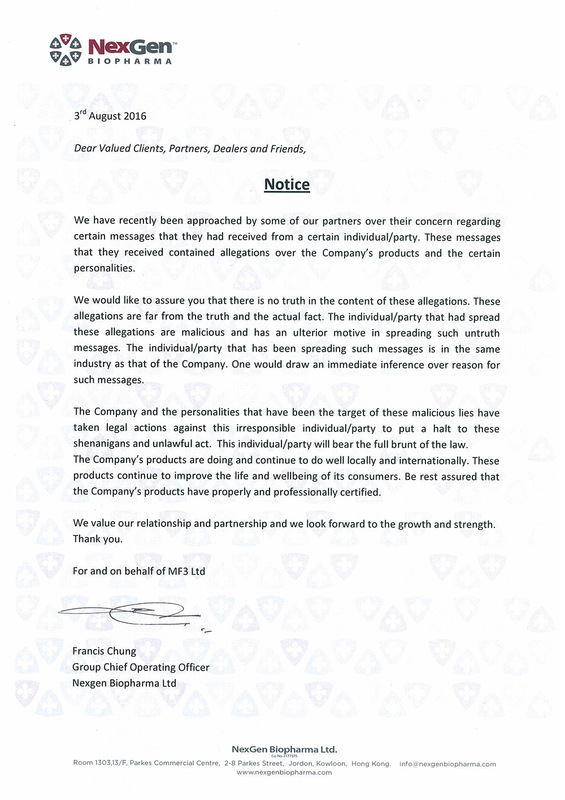 We have recently been approached by some of our partners over their concern regarding certain messages that they had received from a certain individual/party. These messages that they received contained allegations over the Company’s products and the certain personalities. We would like to assure you that there is no truth in the content of these allegations. These allegations are far from the truth and the actual fact. The individual/party that had spread these allegations are malicious and has an ulterior motive in spreading such untruth messages. The individual/party that has been spreading such messages is in the same industry as that of the Company. One would draw an immediate inference over reason for such messages. The Company and the personalities that have been the target of these malicious lies have taken legal actions against this irresponsible individual/party to put a halt to these shenanigans and unlawful act. This individual/party will bear the full brunt of the law. The Company’s products are doing and continue to do well locally and internationally. These products continue to improve the life and well being of its consumers. Be rest assured that the Company’s products have properly and professionally certified. We value our relationship and partnership and we look forward to the growth and strength.